Australian businesses are taking an increased interest in Mongolia as market opportunities expand from mining which accounts for approximately 20 per cent of GDP to the economy, to include water management solutions. Brendan Coyne, Austrade’s Trade Commissioner and Consul-General in Mongolia, said the relationship between Australia and Mongolia was strong as demonstrated by the large presence of Australian companies and the opening of the Australian Embassy in Ulaanbaatar in December 2015. ‘There are many Australian mining business operating in Mongolia, especially Australia’s world-class and highly regarded mining equipment, technology and services (METS) companies,’ said Coyne. There are an estimated 200 Australian businesses that have already provided services valued at more than $US83 million to the Oyu Tolgoi (OT) copper-gold mine in the South-Gobi region. The OT mine, which provides the majority of the copper-gold ore in Mongolia, is planning to commence an underground expansion and recently a multinational finance deal valued at $US4.4 billion was secured to support this expansion. Institutions involved in this deal included export credit agencies from Canada, the US and Australia through Efic. While numerous initiatives have been held for Australian METS companies to explain the opportunities in Ulaanbaatar, a recent‘Doing Business in Mongolia’ business breakfast involving AustCham Mongolia attracted over 90 participants – which was AustCham’s largest attended event. ‘The business breakfast featured a panel discussion involving five experts covering different aspects of commencing and undertaking business within the mining sector in Mongolia. 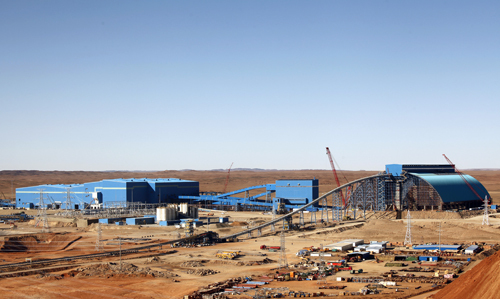 ‘It also leveraged off a major forum Oyu Tolgoi held promoting its Underground Development to suppliers that attracted over 600 organisations and approximately 50 Australian organisations attended which included nearly 30 companies who travelled from outside Mongolia,’ said Coyne. The opportunities for Australian companies to work with Mongolia were further highlighted at the recent opening of a groundwater monitoring network in the city of Choir, approximately 200 km south of Ulaanbaatar. ‘While mining is important to the economy of Mongolia, there is recognition that water management is central to allow sustainable economic development to occur, particularly in rural areas where agriculture is a part of life. ‘This recognition presents growing opportunities for Australian businesses that can offer new technology and solutions to address water management and conservation concerns,’ said Coyne. Austrade has also just developed the Mongolian Mining Projects Report 2015 which provides a comprehensive guide for Australian METS exporters considering doing business in Mongolia.